Welcome to Casa Ciricote, our newest luxury vacation rental property; located in Playa Del Carmen on the Caribbean in the center of the Mayan Riviera in Quintana Roo, Mexico. Our newly remodeled two story, 2 bedroom, 3 bath town home and 1 bedroom penthouse suite share a large pool; and offer you luxury, comfort, and security. These properties are located only 5 minutes walk away from 5th avenue. They are both well equipped, take a look at this list of amenites. 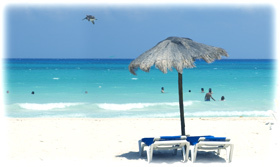 Their in-town location puts you just a short walk from the beach, fine dining, windsurfing, dive shops, and snorkeling. Playa del Carmen's location in the center of the Mayan Riviera will put you in close proximity to many other great area attractions. 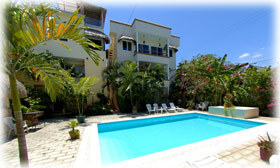 Please take a look at the slideshows to see more of Casa Ciricote, the surrounding area and Yucatan Peninsula. To book Casa Ciricote for your next vacation, please complete this form. Need something bigger, and on the ocean? Villa Flamboyan is a four bedroom home with a private pool.